Featuring a keynote address by Jason Russell, Bobby Bailey and Laren Poole, Founders of Invisible Children Inc. and recipients of the 2008 Human Security Award. 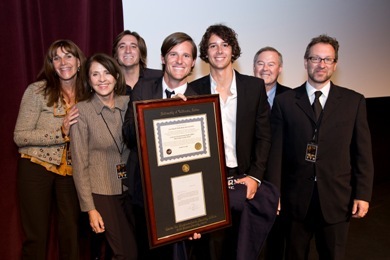 Jason Russell, Bobby Bailey and Laren Poole filmmakers and the founders of Invisible Children Inc. received the 2008 Human Security Award in recognition of their dedication to empowering young people and raising awareness and support for the children of Uganda. Russell, Bailey and Poole set out on a film-making adventure in Africa and ended up creating a movement that channels the creativity and energy of youth in the United States and Europe into a variety of programs that allow viewers of their films to become supporters and generate resources to provide health, safety and education for the children of Uganda who are affected by a more than 20-year-long war. The Human Security Award recognizes the remarkable efforts of people working to empower and protect the world’s most vulnerable communities. Jason Russell, Bobby Bailey, and Laren Poole, are the founders of Invisible Children Inc. What started out as a film-making adventure in Africa, transformed into much more, when these three young Americans original travels took a divine turn, and they found themselves stranded in Northern Uganda. They discovered children being kidnapped nightly from their homes and forced to fight as child soldiers. The film that resulted, is fast-paced with an MTV beat, and is dedicated to exposing this tragic and horrifying untold story. They originally screened the film in June 2004 for friends and family and soon expanded to high schools, colleges, and religious institutions, from suburban living rooms to Capitol Hill, with coverage on CNN, the National Geographic Channel, and more, this film has taken on a life of it’s own. After audiences viewed the movie, one question repeatedly surfaced, “What can we do?”And so, a non-profit was born to empower the individual viewer to become a part of the story, and “be the change they wish to see in the world”through action. Invisible Children , Inc. has developed a variety of programs to allow viewers of their films to become supporters and generate resources to provide health, safety and education for the children of Northern Uganda who are affected by this 20-year-long war.